We design hardware for the medical community. We offer product development services in the areas of prototyping, design and development, as well as testing and analysis. Our domain expertise is in the development of Class II medical devices intended for surgery. In particular, we play at the intersection of mechanical engineering, electrical engineering, and computer science. Our mission is to improve the human experience by launching the very best medical devices to market for our clients. We produce simple, elegant designs with an eye towards manufacturability. We use Computer Aided Design tools to model complex electro-mechanical and opto-mechanical assemblies prior to fabrication and design our assemblies with manufacturing in mind, planning out toolpaths if necessary. We utilize modern manufacturing methods whether it be 3D printing, traditional machining, silicon / injection molding, urethane casting, thermoforming, or carbon fiber. We work with our partners to ensure your designs are manufacturable in appropriate quantities. We are familiar Geometric Dimensioning and Tolerancing (ASME Y 14.5) and standard drawing techniques. We design the circuits that drive hardware platforms. We use digital logic components, such as various 8 - 32 bit microcontrollers (Microchip PICs, Atmel AVRs) and National Instruments hardware, to design circuits that drive hardware. We implement various low level protocols (i.e. SPI, I2C, TCP/IP) to enable communication, integrate sensors, and acquire data. We are also capable of implementing control algorithms such as PWM for motion control. We have gone through the UL / CE Mark Certification process and are familiar with IEC 60601. We write software that runs on top of hardware platforms. We design application workflows and user interface to the customer needs through a careful 'jobs-to-be-done' analysis. We are certified in agile software development frameworks. We have specialized expertise in areas such as anatomical registration and image analysis. We test until we break things. We are intimately familiar with 21.CFR.820, ISO9001, ISO13485 and the concept of design controls. 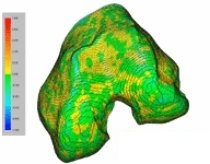 We utilize tools such as CMM machines, Laser Scanners, and Optical Comparators to conduct physical inspections of parts when necessary and use 3D inspection software to confirm that point clouds measured from physical models match design tolerances. We conduct statistical analysis and provide test reports utilizing Six Sigma methodology. Start with a background search and establish the freedom to operate. If possible, identify the closest predicate device. Brainstorming with others, use a 'design thinking' approach to expand on many solutions before narrowing to just a few. Build a low fidelity prototype inspired by ideation sessions. Use it to de-risk key technical features and evaluate an early fit to the clinical need. It may be necessary to build several minimum viable prototypes before deciding on a particular approach. With an approach to the solution in mind, it's time to gather more information. Develop a complete clinical workflow map of product use based on multiple users' input. Capture the requirements and potential fault modes in a document. Estimate the time to develop and consider what type of resources may be needed to construct the device. Craft a regulatory strategy for product release. Execute the plan. Design parts in a 3D CAD package, build custom circuits, wire-frame a software application. Conduct documented design reviews before fabricating. Build the high fidelity prototype. Once the high fidelity prototype is built, a period of rigorous testing should occur to gather data, work out various defects, and plan improvements that will make it into a revised version. With the problem and solution well understood, this is also a good time to file a Regular Patent Application. The 6 point process laid out above covers the Design Input and Design Output phases from the FDA code of regulations for medical devices (21.CFR.820). It is by no means a strictly linear process, and it may be necessary to repeat certain steps to get the product right. From this point on, the design is slightly tweaked as it is made to fit the manufacturing process of choice. The now Production-Equivalent prototype undergoes a verification and validation period to demonstrate that it meets documented requirements and that clinical risk has been appropriately mitigated. Finally the device is transferred to the manufacturing teams and it is officially launched. We enjoy the product development process and are happy to work with you if you are a lone inventor just starting out or an established company somewhere along the way. Sachin Bhandari studied Mechanical and Electrical Engineering at the Cooper Union for the Advancement of Science and Art, and also completed his Masters in Mechanical Engineering at the same university. His interests are in robotics and constructing electro-mechanical and opto-mechanical assemblies. Sachin is a Certified Lean Six Sigma Black Belt and has achieved certifications in Agile Product Development methodologies as well. Sachin has worked on a number of computer-assisted navigation systems that have made their way to market in some form or another - from his time at NYU's minimally invasive surgery lab, to Mako Surgical (now Stryker), to more recently Cirle - where Sachin managed a cross-functional team in the hardware and software development of an image acquisition and injection system for a surgical microscope, customized for anterior segment eye surgery. The system was acquired by Bausch and Lomb in May of 2014.